Shredder’s latest scheme is to acquire more Mutagen and create more mutants. Due to a storm in Dimension X, the Mutagen canister lands in a Florida swamp rather than the Big Apple. Shredder heads south to recover the canister and discovers four mutant frogs. He realizes their potential and makes plans to return to New York City with them. Meanwhile, April notifies the Turtles of the discovery of four frog monsters, but before the TMNT can leave for Florida, they must take care of Rocksteady and Bebop, who are causing problems during Shredder’s absence. Shredder gives his new disciples the names ATTILA THE FROG, GENGHIS FROG, RASPUTIN THE MAD FROG and NAPOLEAN BONAFROG. Shredhead trains them in martial arts and sets them loose on the city. The local authorities believe that the Turtles are responsible for these crimes and create an Anti-Turtle Force to hunt them down. The TMNT, realizing they are being framed, set out to find the frogs. The Turtles find the frogs at a local chemical supply company. However, the evil amphibians escape with a batch of chemicals. Donatello realizes that the chemicals that were stolen are two thirds of the ingredients needed to make Mutagen. The Green Team contact April to see if she can find a company that manufactures the fourth ingredient. April finds a location and the Turtles race to it and catch the frogs. Then they watch in horror as the Anti-Turtle Force arrives on the scene and freeze dries the frogs. 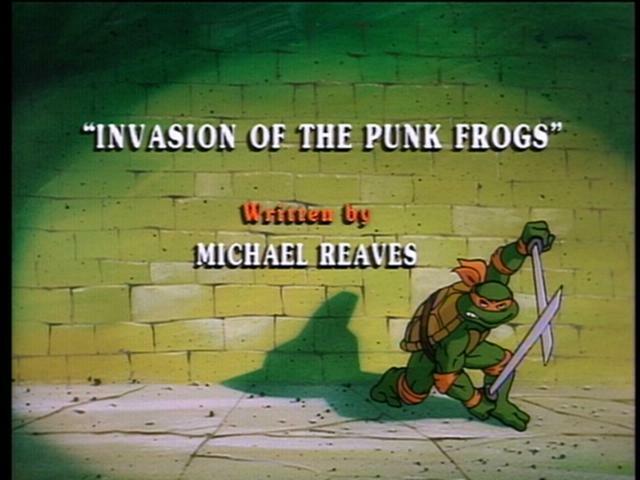 The TMNT escape the same fate and then decide to save their fellow mutants and retreat back to the lair in hopes that Splinter will know what to do. The Sensei suggests that they thaw out the Frogs and reason with them – let their animal instincts tell them whom to trust. It works and the Turtles and Frogs team up to lure Shredder into a trap, but the Anti-Turtle Force arrives and creates just the right diversion to allow Shredder, Rocksteady and Bebop to make their escape.